Not long ago, the delightful teacher of my younger son's class came to me with a proposition. 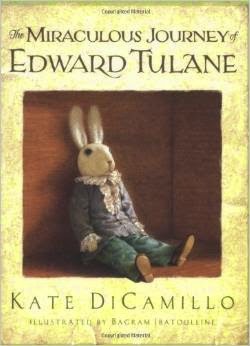 She was planning to read 'The Miraculous Journey of Edward Tulane' to the class and wanted a stuffed rabbit to use for associated activities. She had searched everywhere for a rabbit that was distinguished enough to use as Edward, but had not found anything. Well, it seems that word of my sewing addiction has reached the school as the teacher asked me if I could make something that would fit the bill. 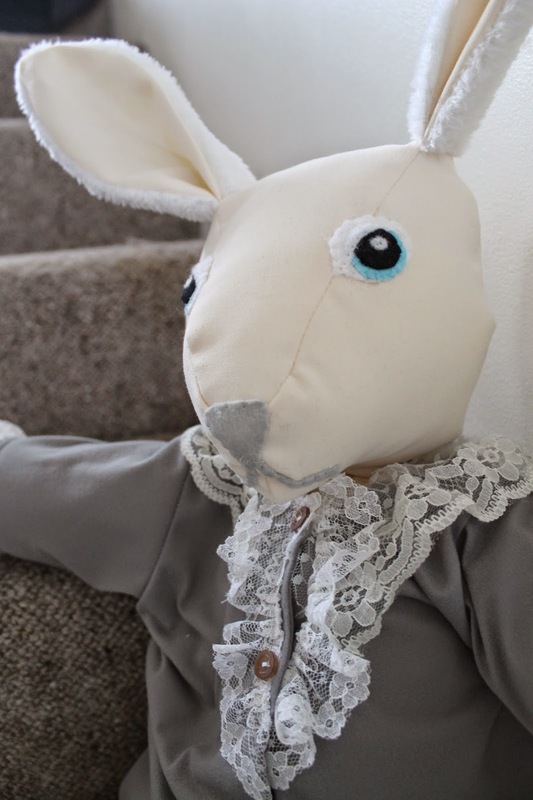 I don't make many toys, but creating this adorable rabbit was certainly a project I could enjoy. I googled as many images from the book as I could find. 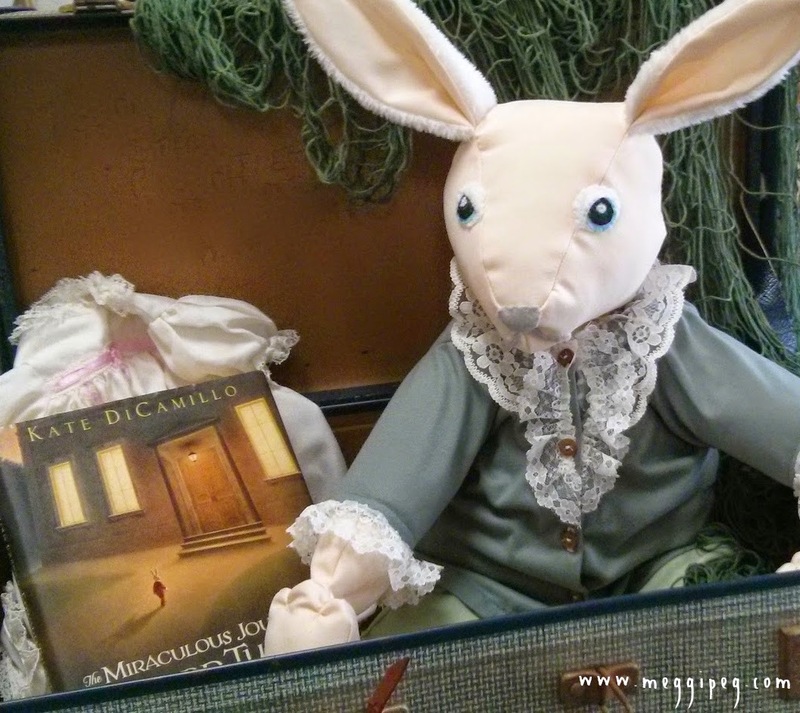 I also found a lady who has posted pictures of her own beautiful Edward Tulane stuffed rabbits. I found a book in the library ('Creative soft toys to sew' by Creative House) with a rabbit pattern that I thought I could modify to look the part. I decided to make everything from materials I already had, which was not difficult given the resources in my bursting-at-the-seams sewing room. 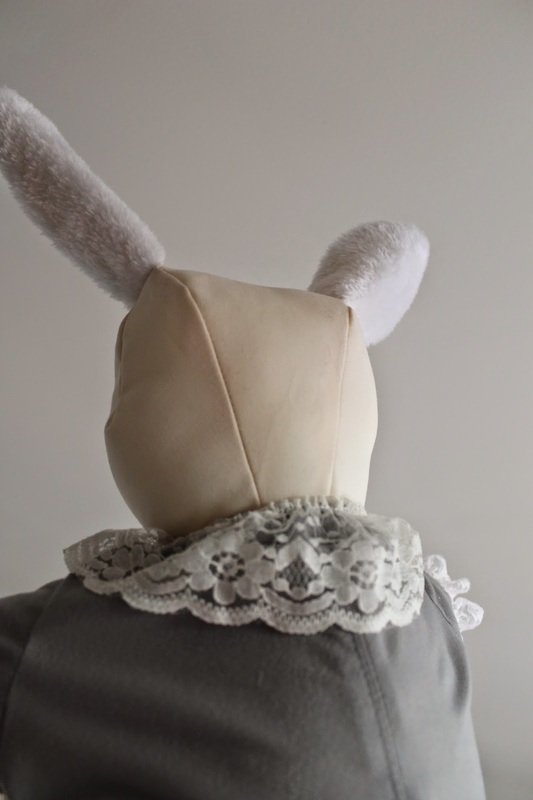 The main body is made from a lovely off-white cotton (op shopped) and the ears are made from scraps of white fur fabric left over from dance costumes. The clothes are also made from scraps. I used felt for the eyes and nose. After I had made and stuffed the head, I slimmed down Edward's face with hand-stitched darts below the ears. I wanted the ears to stand up as in the book illustrations so inserted copper wire into each one. I used long wire so it also ran through the head and down into the chest area to provide head support. I layered the parts of the eyes and handstitched each layer together before sewing the eyes to the head. I thought that was safer than trying to embroider the eyes straight on. 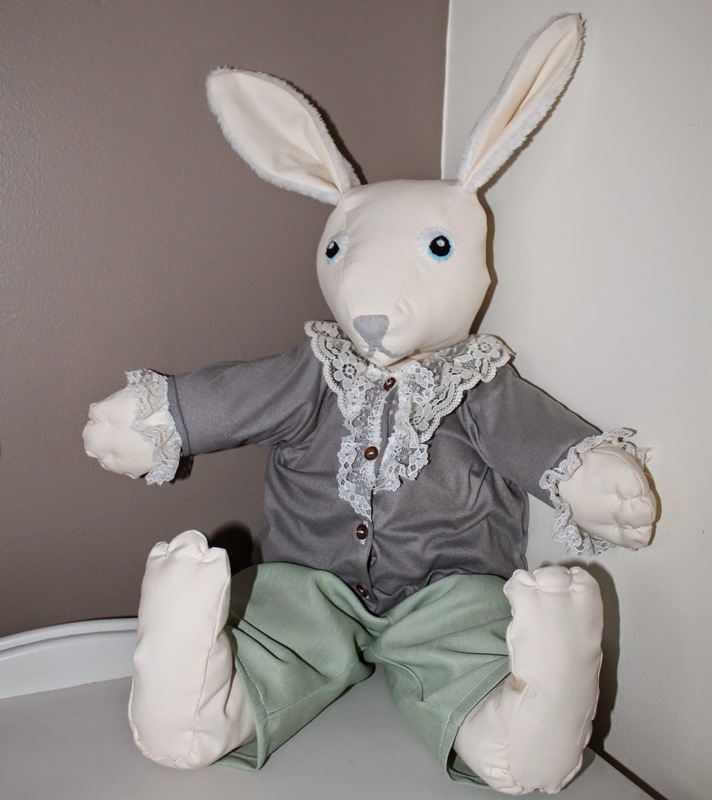 The clothes were made using a pattern for baby clothes, which I modified to fit Edward. I tried to make the colours of the clothes and the lace embellishments as authentic to the book illustrations as possible. I also added some hand stitches on the hands and feet to make rabbitty fingers and toes. I loved this project and was over the moon with the final result. I think my Edward turned out a lot like the rabbit in the book and, although I am not a soft-toy fan, I was a bit sad to have to let him go! I took him to JJ's class the day after I finished him. Since then, I have had so many children come up to me and say how much they love Edward. The teacher is reading the book to the class at the moment and the children get to take turns holding Edward during the story. It makes me all glowy every time I think about it. The class also made me a lovely card and the teacher bought me a beautiful scarf to say thank you. Thank YOU Mrs G for all you do for the children and for involving me in this fun project. What a wonderful addition to your child's classroom! You did a great job creating something that I'm sure will be used for many years to come. So sweet, and a beautiful rabbit! You made a perfect Edward!!! Edward is AWESOME!!! That's one lucky teacher to have you sew for her and her class. I'm sure the kids will love and remember their lessons with Edward. I have no doubt that every teacher in the school will have seen Edward and will be hoping to have you as a parent next year! well done - i also make edwards but i guess you didn't spot me?